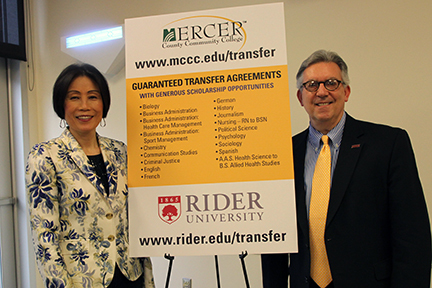 WEST WINDSOR – Mercer County Community College (MCCC) and Rider University have expanded the number of guaranteed transfer agreements from five to 23, giving Mercer graduates even more opportunities to transfer to Rider with full junior status. 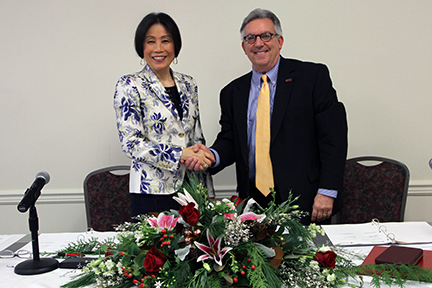 MCCC President Dr. Jianping Wang and Rider President Dr. Gregory G. Dell’Omo represented their respective institutions during a signing ceremony Dec. 14 at The Conference Center at Mercer. The Health Care Management program was chosen to sign symbolically, illustrative of all 18 new agreements. The new agreements grant full junior-class admission to Rider for MCCC students who have declared their participation in the program before accruing 30 credit hours at MCCC, have taken and completed all courses in the prescribed program curriculum, have earned their associate degree, and have earned a cumulative GPA of at least 2.5. Rider will waive application fees. In addition to Health Care Management -- the newest Rider program that is part of the agreement -- other degree programs included are: Business Administration, Business Administration with a co-major in Sport Management, Communication Studies, Biology, Chemistry, Criminal Justice, Psychology, English, French, German, History, Journalism, Sociology, Spanish, Political Science, Nursing, and Allied Health Studies. These are in addition to existing agreements in the areas of Global Studies, Elementary Education, Information Systems, Finance, and Global Supply Chain Management. MCCC President Dr. Jianping Wang and Rider University President Dr. Gregory Dell'Omo following the ceremonial signing of 18 new guaranteed transfer agreements. MCCC President Dr. Jianping Wang and Rider University President Dr. Gregory Dell'Omo with a poster promoting the 18 new guaranteed transfer programs. Faculty and staff of MCCC and Rider University celebrate the signing of 18 new guaranteed transfer agreements. To mark the occasion of the continuing partnership between Rider and MCCC, Rider’s Dell’Omo presented a Sesquicentennial Medal of Excellence to MCCC. The honor celebrates Rider’s 150th Anniversary and is bestowed on select individuals and organizations for their significant contributions in assisting the university in better serving its students. Wang accepted the medal on behalf of MCCC. Over the past five years, more than 350 students have successfully transferred from MCCC to Rider, more than any other community college. MCCC also remains Rider’s largest articulation partner. “I am honored to receive this recognition on behalf of Mercer County Community College,” Wang said. “I look forward to a continued partnership with Rider University focused on student service and educational excellence."